Pokemon Go and Recruiting's AR Future: Gotta Recruit 'Em All! 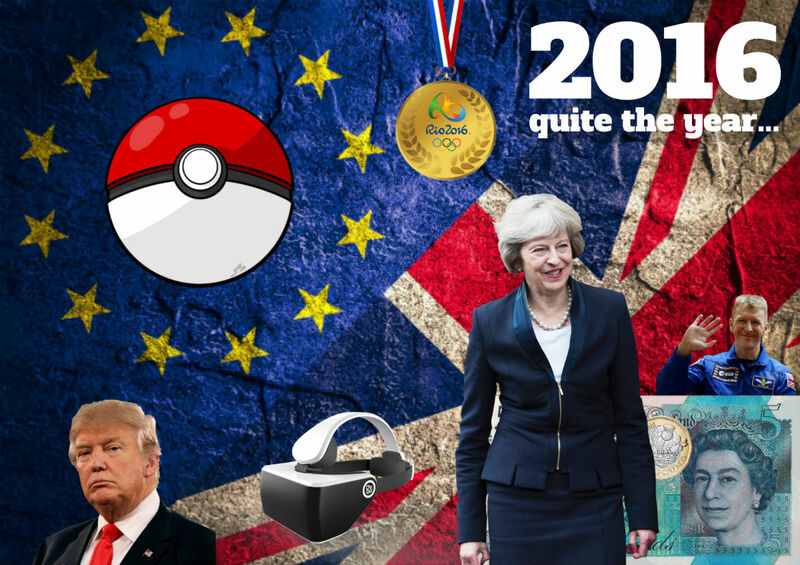 As another year draws to a close, it's the perfect time to reflect on the previous 12 months and take a look at the major news events that have impacted UK businesses. So with 2017 just around the corner, let's cast our mind back to five of the biggest stories that made the front (and back) pages of the newspapers in 2016. On April 1st, the minimum wage adopted a more sophisticated moniker and has since been presenting itself as the National Living Wage. It's important to note, however, that the National Living Wage is different to what is recommended by the Living Wage Foundation - another name that may have crossed your path this year. The Living Wage Foundation is an organisation that takes into account the cost of food, accommodation and various other facets of life before suggesting a realistic income for living. This is currently set at £8.25 an hour (or £9.40 in London! ), significantly above the government's National Living Wage. The National Living Wage and the Living Wage Foundation are not connected. All you really need to know is that minimum pay was set a £7.20 an hour for the over 25s. This is due to increase to £7.50 from April 2017. What effect has the NLW had on businesses? When the NLW was introduced in April, it was predicted that many businesses would pull back on their recruitment plans, or at least rethink their strategy. Well, the British Chambers of Commerce (BCC) seems to think so. A report published by the BCC in September, showed that a quarter of companies reduced their recruitment plans as a result of the NLW. Additionally, 34% plan to pull back on hiring if the NLW reaches the proposed £9 an hour figure by 2020. We should acknowledge that the majority of firms already pay their staff above the NLW, but for those that don't, 2016 has been testing on the purse strings. With the Rio Olympics and European Championships joining Wimbledon et al. on the sporting calendar, we witnessed an excellent summer of athletic competition in 2016. While this was no doubt enjoyed by the millions watching on TV, it raised a problem for businesses looking to avoid a drop in productivity. ...2.3 million people watched the England vs Wales Euro 2016 match (on a Thursday afternoon) via the BBC Sport website. Viewing figures would suggest otherwise. According to the BBC, 2.3 million people watched the England vs Wales Euro 2016 match (on a Thursday afternoon) via the BBC Sport website. This was almost 1.5 million more than the previous high, which was for the London Olympics tennis final in 2012 (a Sunday afternoon). In fact, 18% of workers were said to have been allowed time to watch Euro 2016 matches, with employers perhaps showing flexibility in order to maintain productivity. As for the Rio Olympics, BBC Sport online attracted 68 million UK viewers across computers, smartphones and tablets. Of course, we can't prove how many of these people were at work, but 68 million online viewers over 19 days would suggest something of a work time audience. But did UK productivity suffer? Not really. In fact, output per hour in Q2 (April to June) was 0.6% higher than Q1 (January to March). This period covered the first week of Wimbledon and the majority of Euro 2016. Output per hour is estimated to have increased by a further 0.2% in Q3 (July to September), although this is a slowdown in growth. Can sport explain this slowdown? In June, the UK public voted in favour of leaving the European Union, in an action dubbed as 'Brexit'. Although we're yet to realise the full implications of this result, the world of recruitment has already started to experience the impact of a leave vote. How did Brexit impact recruitment in 2016? While the value of the pound may have dropped, and employer concerns may have grown, hiring has largely remained steady in this post-referendum limbo. In fact, at the end of October, the REC's JobsOutlook survey revealed that 23% of businesses were looking to recruit more staff before the year was through. The one area that has seen a real impact though, is the graduate market. According to UCAS, the number of university applications from EU students has dropped by 9%. This is particularly bad news for the technology sector, which relies on graduates from overseas to plug skill gaps. We're still in the early days folks, and with no real idea of where this is going, the biggest threat to businesses at the moment is uncertainty. It might only have been six months ago, but the quick rise and fall of Pokemon Go has us feeling almost nostalgic at the thought of catching another Zubat in a supermarket car park. Pokemon Go was arguably this year's biggest surprise hit, bringing augmented reality (AR) to the mainstream. What was once the ideal of the futurist has now firmly pushed itself into the public psyche. In fact, 2016 really has been the year for augmented and virtual reality, with all the major technology players releasing their own devices. But does recruitment have a future in AR and VR? While it might require a giant leap from chasing Nintendo pinatas around a field, continued investment in the technology could see augmented reality developing business functions in the not too distant future. Perhaps it could be used for staff training? Or to give candidates an insight into a workplace? If we get the technology right, the possibilities are endless (probably), so watch this space. You may have missed it, but the government finally gave their approval (in principle) for the expansion of Heathrow. Following four years of talks, only a one year review period now stands in the way of plans to build a third runway at the UK's largest airport. Why is the third runway so significant? Simply, jobs and the economy. In the next 60 years, the third runway is expected to provide a £61 billion boost to the economy. Combine this with the 77,000 local jobs that are to be created by 2030, and you have a pretty momentous decision. As with any development of this scale, there is some opposition - none much larger than Sadiq Khan. The Mayor of London is throwing his considerable weight behind a legal challenge which also involves Greenpeace, Transport for London and a number of local councils. In the next 60 years, the third runway is expected to provide a £61 billion boost to the economy. As a result of the expansion, 200,000 London residents are expected to face a level of noise that most would deem intolerable. In addition to this, air pollution is set to further increase, in an area where pollution is already above legal levels. There's still a way to go before this happens, but London businesses (and inhabitants) will certainly be keeping up-to-do date on third runway developments. 2016 has certainly been a year of surprises (to say the least!) and businesses have had to consider the impact of both economic and technological changes. However the past 12 months have affected you, we at Agency Central wish you all the best for 2017 and hope you achieve your corporate and personal goals.